The Andaman Sea (historically also known as the Burma Sea) is a marginal sea of the eastern Indian Ocean separated from the Bay of Bengal (to its west) by the Andaman Islands of India and Myanmar and the Nicobar Islands of India and touching Myanmar, Thailand, and the Malay Peninsula. Its southernmost end is defined by Breueh Island, an island just north of Sumatra. Traditionally, the sea has been used for fishery and transportation of goods between the coastal countries and its coral reefs and islands are popular tourist destinations. The fishery and tourist infrastructure was severely damaged by the 2004 Indian Ocean earthquake and tsunami. The Andaman Sea, which extends over 92E to 100E and 4N to 20N, occupies a very significant position in the Indian Ocean, yet remained unexplored for long period of time. To the south of Myanmar, west of Thailand, and north of Indonesia, this sea is separated from Bay of Bengal by the Andaman and Nicobar Islands and an associated chain of sea mounts along the Indo-Burmese plate boundary. The Strait of Malacca (between Malay Peninsula and Sumatra) forms the southern exit way of the basin, which is 3 km wide and 37 m deep. On the Southwest. A line running from Oedjong Raja (5°32′N 95°12′E﻿ / ﻿5.533°N 95.200°E﻿ / 5.533; 95.200) in Sumatra to Poeloe Bras (Breuëh) and on through the Western Islands of the Nicobar Group to Sandy Point in Little Andaman Island, in such a way that all the narrow waters appertain to the Burma Sea. On the Northwest. The Eastern limit of the Bay of Bengal [A line running from Cape Negrais (16°03'N) in Burma [Myanmar] through the larger islands of the Andaman group, in such a way that all the narrow waters between the islands lie to the Eastward of the line and are excluded from the Bay of Bengal, as far as a point in Little Andaman Island in latitude 10°48'N, longitude 92°24'E]. The northern and eastern side of the basin is shallow, as the continental shelf off the coast of Myanmar and Thailand extends over 200 km (marked by 300 m isobath). About 45 percent of the basin area is shallower (less than 500 m depth), which is the direct consequence of the presence of the wider shelf. The continental slope which follows the eastern shelf is quite steep between 9N and 14N. Here, the perspective view of the submarine topography sectioned along 95E exposes the abrupt rise in depth of sea by about 3,000 m within a short horizontal distance of a degree. Isobaths corresponding to 900 m and 2000 m are also shown in the figure to emphasize the steepness of the slope. Further, it may be noted that the deep ocean is also not free from sea mounts; hence only around 15 percent of the total area is deeper than 2,500 m.
The northern and eastern parts are shallower than 180 meters (590 feet) due to the silt deposited by the Irrawaddy River. This major river flows into the sea from the north through Myanmar. The western and central areas are 900–3,000 meters (3,000–9,800 ft) deep. Less than five percent of the sea is deeper than 3,000 meters (9,800 feet), and in a system of submarine valleys east of the Andaman-Nicobar Ridge, the depth exceeds 4,000 meters (13,000 feet). The sea floor is covered with pebbles, gravel, and sand. 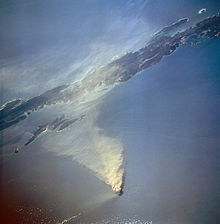 The western boundary of Andaman Sea is marked by volcanic islands and sea mounts, with straits or passages of variable depths that control the entry and exit of water to Bay of Bengal. 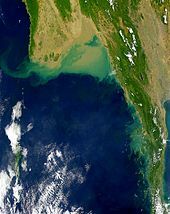 There occurs a drastic change in depth of water over a small distance of 200 km, as one moves from Bay of Bengal (around 3,500 m deep) to the vicinity of islands (up to 1,000 m depth) and further into the Andaman Sea. The exchange of water between the Andaman Sea and the Bay of Bengal occurs through the straits formed between the Andaman and Nicobar Islands. Out of these, the most important straits (in terms of width and depth) are: Preparis Channel (PC), Ten Degree Channel (TDC), and Great Channel (GC). PC is the widest but shallowest (250 m) of the three and separates south Myanmar from north Andaman. TDC is 600 m deep and lies between Little Andaman and Car Nicobar. GC is 1,500 m deep and separates Great Nicobar from Banda Aceh. Running in a rough north–south line on the seabed of the Andaman Sea is the boundary between two tectonic plates, the Burma Plate and the Sunda Plate. These plates (or microplates) are believed to have formerly been part of the larger Eurasian Plate, but were formed when transform fault activity intensified as the Indian Plate began its substantive collision with the Eurasian continent. As a result, a back-arc basin center was created, which began to form the marginal basin which would become the Andaman Sea, the current stages of which commenced approximately 3–4 million years ago (Ma). Within the sea, to the east of the main Great Andaman island group, lies Barren Island, the only presently active volcano associated with the Indian subcontinent. This island-volcano is 3 km (2 mi) in diameter and rises 354 meters above sea level. Its recent activity resumed in 1991 after a quiet period of almost 200 years. It is caused by the ongoing subduction of the India plate beneath the Andaman island arc, which forces magma to rise in this location of the Burma plate. The last eruption started on 13 May 2008 and still continues. The volcanic island of Narcondam, which lies further north, was also formed by this process. No records exist of its activity. The climate of Andaman Sea is determined by the monsoons of southeast Asia. The wind system over the regime reverses every year. The region experiences north-easterlies with an average windspeed of 5 m/s in the months of November to February. During these months, the western part of the domain experiences maximum wind intensity. It weakens by March–April and reverses to strong south-westerlies from May to September, with mean wind speeds touching 8 m/s in June, July and August, distributed nearly uniformly over the entire basin. The wind plummets by October and switches back to north-easterlies from November. Air temperature is stable over the year at 26 °C in February and 27 °C in August. Precipitation is as high as 3,000 mm/year and mostly occurs in summer. Sea currents are south-easterly and easterly in winter and south-westerly and westerly in summer. The average surface water temperature is 26–28 °C in February and 29 °C in May. The water temperature is constant at 4.8 °C at the depths of 1,600 m and below. Salinity is 31.5–32.5‰ (parts per thousand) in summer and 30.0–33.0‰ in winter in the southern part. In the northern part, it decreases to 20–25‰ due to the inflow of fresh water from the Irrawaddy River. Tides are semidiurnal (i.e., rising twice a day) with an amplitude of up to 7.2 meters. The sea has long been used for fishing and transportation of goods between the coastal countries. Thailand alone harvested about 943,000 tonnes of fish in 2005 and about 710,000 tonnes in 2000. Of those 710,000 tonnes, 490,000 are accounted for by trawling (1,017 vessels), 184,000 by purse seine (415 vessels), and about 30,000 by gillnets. Of Thailand's total marine catch, 41 percent is caught in the Gulf of Thailand and 19 percent in the Andaman Sea. Forty percent is caught in waters outside Thailand's EEZ. The sea's mineral resources include tin deposits off the coasts of Malaysia and Thailand. Major ports are Port Blair in India; Dawei, Mawlamyine and Yangon in Myanmar; Ranong port in Thailand; George Town and Penang in Malaysia; and Belawan in Indonesia. Wikimedia Commons has media related to Andaman Sea. ^ "Implications of the 26 December 2004 Sumatra–Andaman Earthquake on Tsunami Forecast and Assessment Models for Great Subduction-Zone Earthquakes" (PDF). Bulletin of the Seismological Society of America. 97 (1A): S249–S270. doi:10.1785/0120050619. ^ a b c d e f g h i j k l Panjarat, Sampan (2008). "Sustainable Fisheries in the Andaman Sea Coast of Thailand" (PDF). United Nations. Division for Ocean Affairs and the Law of the Sea. Retrieved 16 May 2015. ^ Wipatayotin, Apinya (2016-04-04). 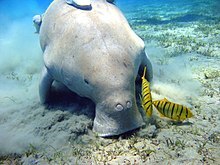 "Rising sea temps bring coral bleaching to Gulf". Bangkok Post. Retrieved 4 April 2016. ^ Oceans in the Balance, Thailand in Focus (PDF). Bangkok: Greenpeace Southeast Asia (Thailand). c. 2012. Retrieved 11 July 2017. This page was last edited on 3 December 2018, at 10:38 (UTC).